Italian language course: one week of lessons with teachers, one week of conversations, excursions, dancing and games, lunches and dinners expressly organized to practice with italian friends that are studing english, a meeting point between the two languages. Italian language holidays in Italy with: one week of lessons with teachers, one week of conversations, excursions, Italian cooking workshops, opera music workshop, dancing and games, lunches and dinners expressly organized to practice with italian friends that are studing english, a meeting point between the two languages. The university City of Camerino in Marche, Italy, 7 km from the accommodation countryhouse Caravanserraglio. This is a unique experience and will introduce you in a relaxed way to the traditions, art, food, wine and life of one of Italy's most beautiful regions. 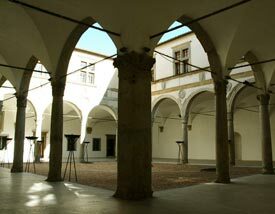 The university of Camerino is located in the former Ducal Palace of Di Varano. conversation lessons in the evenings at the Caravanserraglio restaurant. 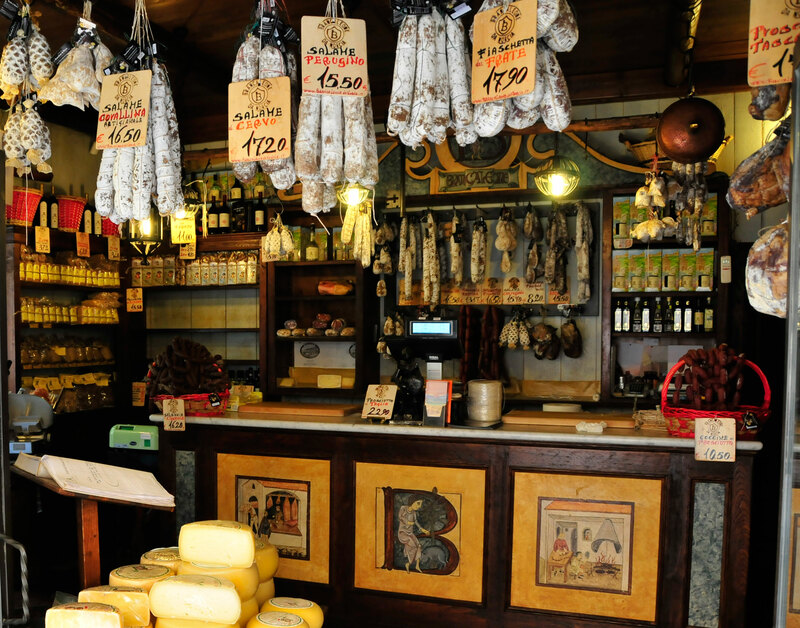 practice about customs and habits at the Italian open markets, about prices and negotiations. 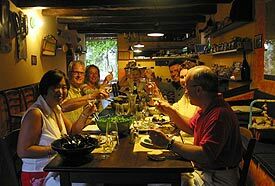 Italian language lessons, practical language activities in the afternoon, Italian workshops, wonderful Italian meals in a good company and accommodation at the Caravanserraglio agriturismo. Italian language immersion for who wants to experience Italian daily life and to practice their Italian. Combine your holidays in Italy with Italian language lessons and workshops! If you are looking for an ideal way to combine intensive study of the Italian language with a relaxing and fun holiday, if you're looking for fully qualified and experienced teachers; if you want to experience Italian culture and social life directly, mingling with the locals and their culture; if you want to practice your Italian language skills during wonderful Italian lunches and dinners, during guided visits to art towns, wine cellars and during hands-on Italian cooking classes and Italian Opera workshops..... Than this is the perfect Italian Language holiday for you!!!! This Italian language holiday presents itself as an opportunity to improve your Italian language and practice everyday conversation skills in fun, social environments. The Italian language lessons are held from graduate teachers in the heart of Italy in the Marche region. 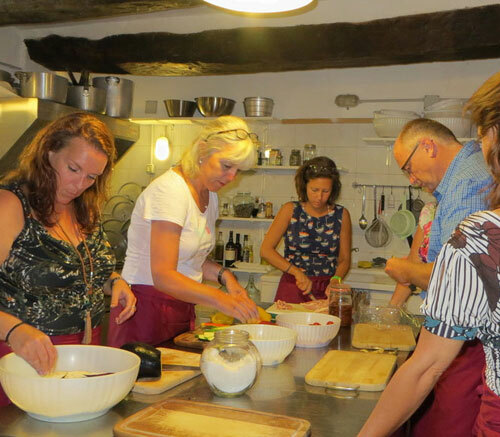 In the afternoons and evenings you practise your Italian during Italian cooking and Opera workshops, Italian wine tastings and delicious characteristic Italian meals with conversations. Transport with private air-conditioned 8 person coach from and to the accommodation. All teachers are native Italian speakers from Italy, fully qualified and experienced in the teaching of Italian as a foreign language. Accommodation at the beautiful Caravanserraglio Countryhouse with swimming pool, in comfortable self-catering apartments. Your Italian host Ennio speak Italian and English and introduce you to the Italian daily life. Characteristic Italian meals based on regional recipes and local produce at the Caravanserraglio restaurant and other carefully selected restaurants. Visit to wine cellar with wine tastings and conversations. Opera music workshop and visit to centuries old theater. Transport by private air-conditioned 8 person coach to and from the accommodation. In the evening the Italia Dolce Vita program: meals in good company, wine tastings, visits to cosy cities and bars. Four hours language lessons per day, every lesson is 60 minutes, from Monday to Friday from 9 Am tot 1 PM. Lively conversationlessons during the afternoons and evenings. 8 Meals & Wine at the Caravanserraglio restaurant. This is a preliminary itinerary and will be altered to accommodate seasonal activities or local festivals. This is a sample menu and can be altered according to the availability of the ingredients, since we want to guarantee fresh local produce of the season. However the essential content of the menu and itinerary will remain the same. In the afternoon arrival at the Caravanserraglio Countryhouse in the Marche, Italy, aperitif and introduction. 8 pm Welcome dinner at the Caravanserraglio restaurant, Introduction to the course program. 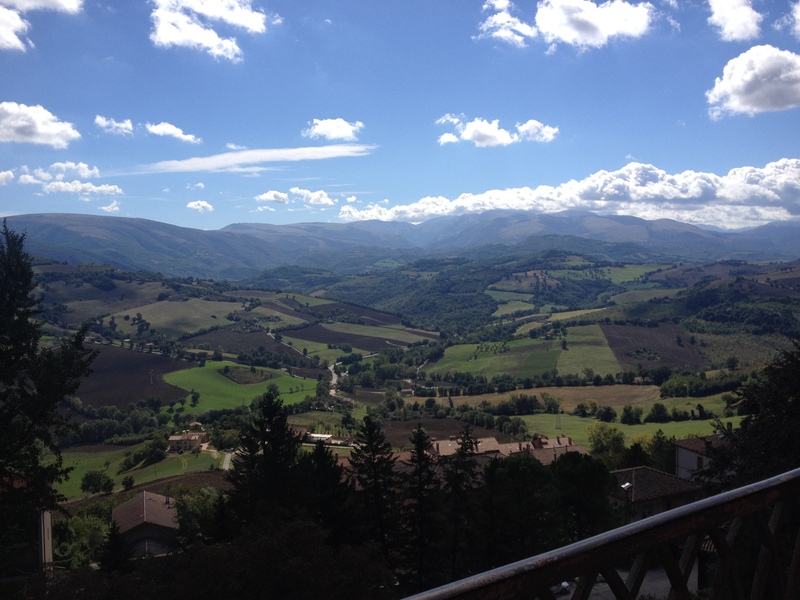 Day 2 - Italian brunch and excursions to picturesque Marche towns. Tranquil awakening at the peacefull agriturismo. 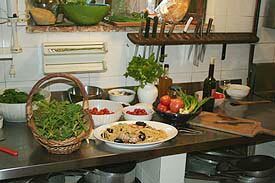 The accommodation at the Caravanserraglio agriturismo is in an independent apartment with kitchen. At your arrival you'll find in the fridge milk, fresh bread, butter, home made marmelate, coffee and tea to prepair breakfast. 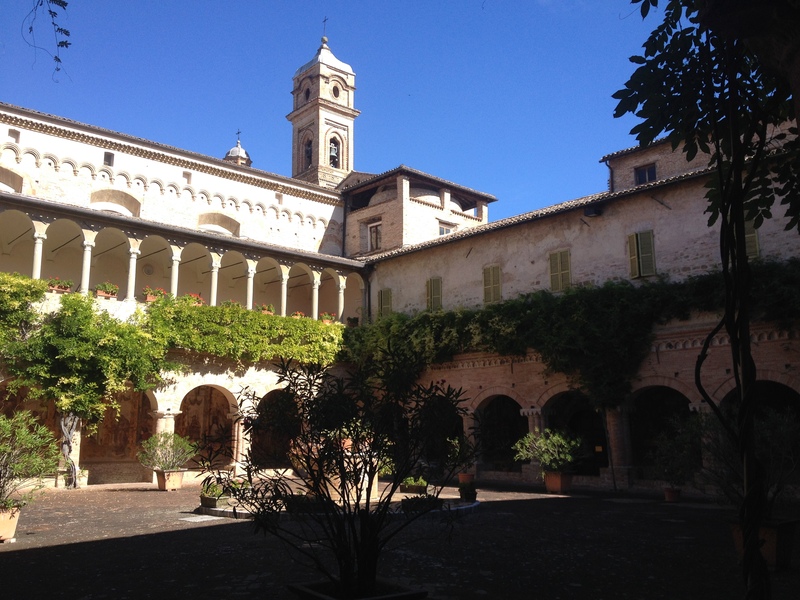 10 am Tour in the surroundings, characteristic Italian Sunday lunch with Italian conversation lessons at cosy Italian restaurant situated at the grounds of the 12th Century abbey of Fiastra. The wonderful gardens surrounding the abbey are thé place to meet up during the weekend. In the afternoon visit to the City of Macerata during the Italian passeggiata hours, enjoying a rich Italian aperitif with small appetizers. 8 pm Dinner at the Caravanserraglio restaurant with wine tastings and conversations. Day 3 - 1st Italian language lesson. Italian language lessons from 9.00 am to 13.00 pm. 5.00 pm Back to the accommodation, afternoon at leisure for self-study, relaxing or conversations at the pool. 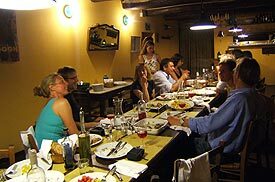 8.00 pm Dinner at the Caravanserraglio restaurant with wine tastings and conversations. Day 4 - 2nd Language lesson and tour to wine producer. 1.30 pm Characteristic Italian lunch. During lunch lesson about Italian wines. 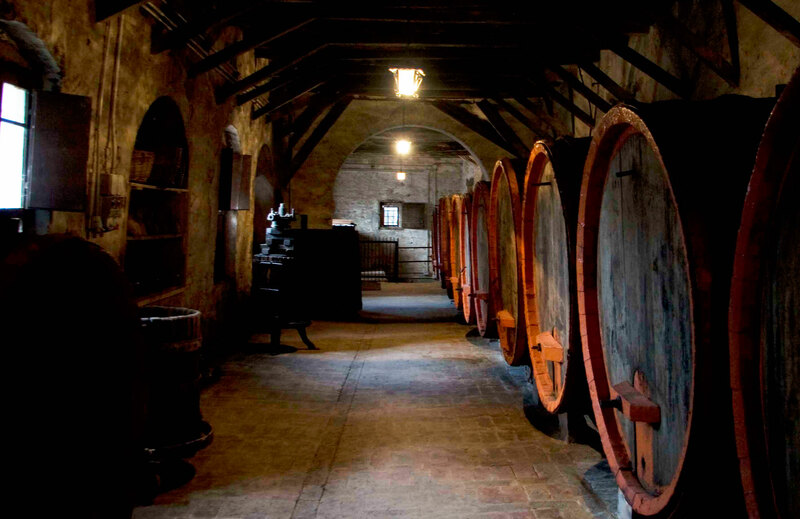 3.00 pm Visit to wine cellar at beautiful wine property with wine tastings and conversations. 5.00 pm Back to the accommodation, afternoon at leisure. 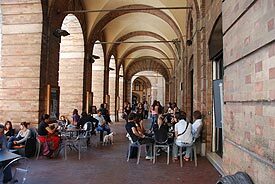 10.00 am Excursion to the open market at the university City of Macerata. 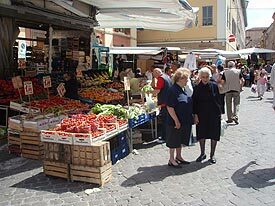 Lessons about the habits and attitudes at the Italian market place, about prices and negotiations. Lunch at cosy restaurant in the center of Macerata. From 3.00 pm to 7.00 pm Italian language lessons. 8.00 pm Dinner at the Caravanserraglio restaurant with wine tastings anAd conversations. Day 6 - 4th Language lesson, visit to historical Italian theater with lessons about Italian opera music. 3 pm Italian lesson with famous opera music. 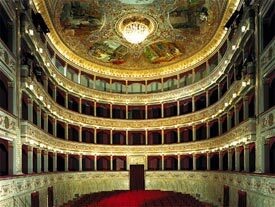 Experiencing classical Italian atmospheres and visit to centuries old theater. 8 pm Dinner at Slow Food restaurant, with wine tastings. Day 7 - 5th Language lesson and cooking course at the Caravanserraglio restaurant. 3.00 pm Back to the accommodation, afternoon at leisure for self-study, relaxing or conversations at the pool. 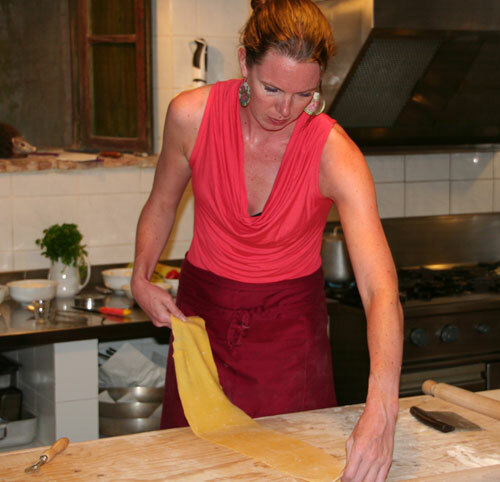 5.00 pm Cooking course at the spacious kitchen of the Caravanserraglio restaurant. 8 pm Dinner at the Caravanserraglio restaurant with festivities. 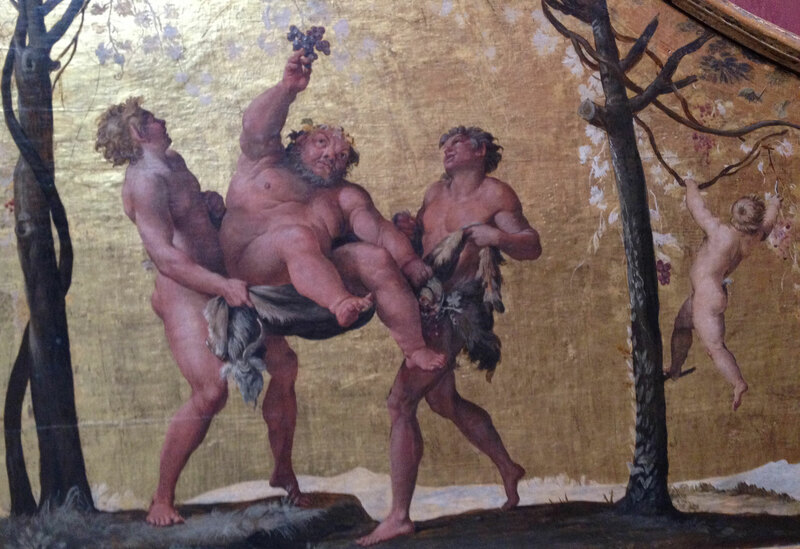 Exercising your Italian In Vino Veritas. Evaluation of the language course and judgAing of Italian language capacities. The maximum number of people for each group is eight, to guarantee our guests a personal entertainment and a good service. The Italian language holiday is in collaboration with graduate teachers.. The level of each participant will be tested beforehand by a written test. Accommodation in comfortable apartments at the property of the Caravanserraglio agriturismo with pool. Your Italian host Ennio of the Caravanserraglio agriturismo speak fluently Italian, English and Dutch and guide you into the daily Italian live. You don't need to be a Dante Alighieri or a Masterchef to join the class. During the day You can participate by helping the chef, cooking under his guidance, or choose just to watch and take notes. It's up to you. Once everything is ready you'll sit at the table to taste all the dishes together with the chef. Come and join us in this funny holiday in the Marche, in this region you can still find the real feeling of the Italian pleasure of life and Italian food. During your holidays you will enjoy guided tours with your fluently English speaking hosts. All Accommodations rooms are with private bathrooms. Ciao and see you in Le Marche!